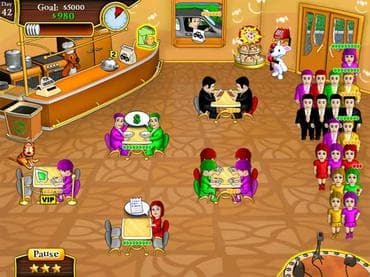 Join Milky the Bear as he sets out to run the best restaurant in town in this free downloadable game! Send Milky scampering all over his restaurant to seat customers, take orders, serve food, collect money and clear tables. It's not easy satisfying a room full of hungry patrons as you wait on drive-thru customers and take reservations over the phone, but with Milky's musical talent and help from the dessert tray, you might survive the shift. Earn enough cash to keep the restaurant open and you might just win the contest! Features: - Fast-paced point-and-click gameplay; - 2 game modes; - Help Milky win a 60-day contest; - Upgrade to bigger and better restaurants; - Adorable characters; - Serve VIP and drive-thru customers; - Select awesome upgrades in Endless Game; - Hand-drawn comics between levels. If you have questions about Milky Bear: Lunch Frenzy game, please contact us using this form.